In 2013, the Alpe di Siusi half marathon took place for the first time. Due to the unique panorama of the Alpe di Siusi and the excellent and sophisticated route, the sports event had great success in its first edition. 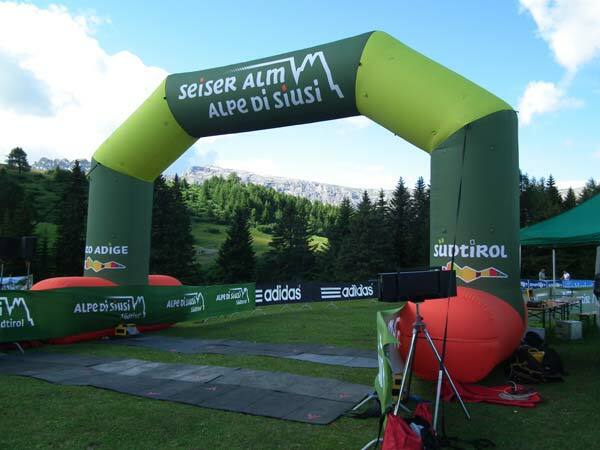 “Alpe di Siusi marketing” is the organizer of the Alpe di Siusi half marathon. The Alpe di Siusi half marathon has a length of 21.1 kilometers. Overall, a height difference of 601 meters has to overcome. Start and finish line is at the Compaccio. The Compaccio is the central place on the Alpe di Siusi; the mountain station of the Alpe di Siusi aerial cableway is located there. The second edition, which took place on 07/06/2014, had exceeded all expectations. The limit of 500 runners set by the organizers (at the first edition in 2013, there were only 250 runners) was already reached ten days before the race. 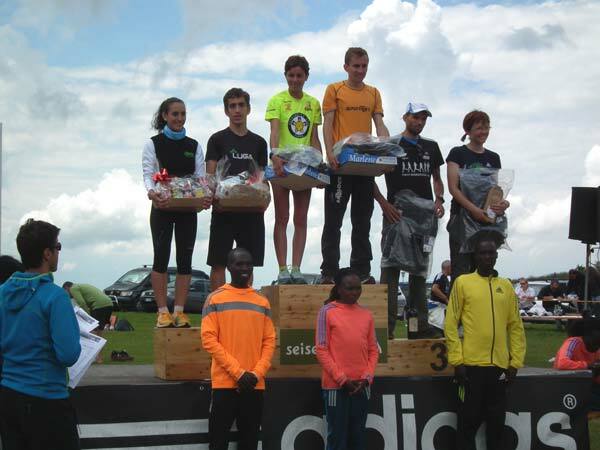 The excellent organization and catering of the runners during the race received praise from all participants. The Kenyan marathon stars have come for many years to the Alpe di Siusi to train especially for the autumn marathons. The training conditions on the Alpe di Siusi with an altitude of between 1,800 and 2,200 meters above sea level are optimal with the varied paths found on Europe's largest mountain plateau. 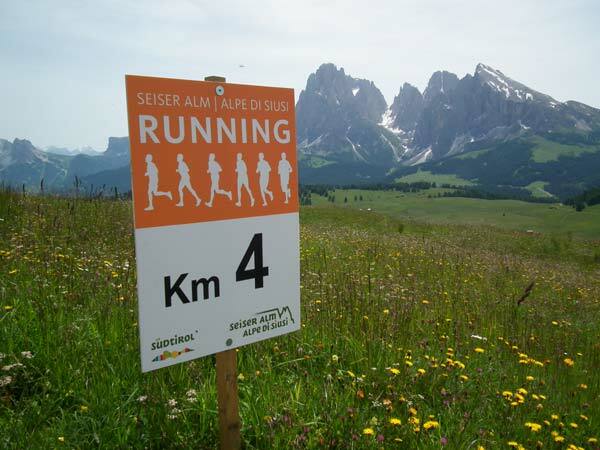 Until 2012 the "Seiser Alm Running" (“Alpe di Siusi running”) was organized as part of the marathon stars' stay. There, the runners had to prove themselves on a 12.7-kilometer running track. In 2013, the track was been extended to a half marathon route. 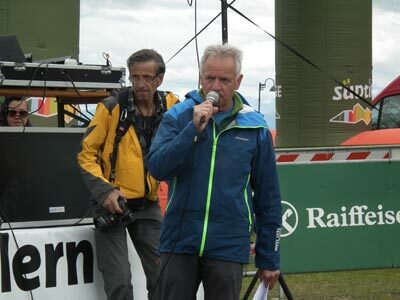 That was the birth of the "Alpe di Siusi half marathon". In the future certainly, this sporting event will continue to be an integral part of the annual event calendar! The route of the Alpe di Siusi half marathon starts at Compaccio. First, on the road to the hotel Ritsch it is about two kilometers relatively flat. The route leads up to the mountain station of the aerial cableway to Ortisei (Val Gardena) on the Piz at the junction before the hotel Ritsch. Then the further route leads back down to hotel Ritsch. The turnoff is between hotel Ritsch and “Rauch”-hut (known Hans and Paula Steger-way). The route continues – after Laranzer hut – up to Almrosen hut. After passing the Almrosen hut, the route continues below the Punta d'Oro (Goldknopf) to the Panorama restaurant, the Laurin hut and to “Spitzbühl”. From Spitzbühl it goes back to the finish line at the Compaccio. From time to time, the Kenyan marathon stars participate at the half marathon – out of competition – to motivate the runners. Although the Alpe di Siusi half marathon took place for the first time in 2013, the event already received the first award. In April 2014, the half-marathon won the "Green Events Austria Gala 2014", although more than 100 candidates were in the category "Sports Events". To get with “GreenEvent” award some points have to be implement creatively and innovatively. This includes, for example, catering with regional, organically produced, seasonal or fairly traded food and drink; travelling with climate-friendly means of transport; separation of waste; social responsibility and handled gently with energy and water. In addition to the special prize, the Alpe di Siusi half marathon has also been certified as a "going Green Event" by the Provincial Agency for the Environment of the Autonomous Province of Bolzano-South Tyrol. "GreenEvents" are events that are planned, organized and implemented according to criteria of sustainability, ecologically-economically and socially. If an event implements more than half of the prescribed activities and fulfills more than three-quarters of the criteria in the second year, the certification can be made as "going green event". Hannes Rungger (from the Sarntal valley, South Tyrol) was able to achieve first place at the Alpe di Siusi half marathon in 2013 and 2014.
in 2018 Jbari Khalid (Italy). The annual stay of the marathon stars from Kenya had also brought the idea to create a "Running Park" on the Alpe di Siusi. The official opening took place on 07/18/2010. On the Alpe di Siusi and in the surrounding Sciliar area with the main villages Castelrotto, Siusi allo Sciliar and Fiè allo Sciliar, 20 routes has been created. They together have a length of about 180 kilometers and have different degrees of difficulty. Some routes have been called after the well-known Kenyan marathon stars. Further information you can find under "Running Park Alpe di Siusi". The next Alpe di Siusi half marathon will take place on 07/07/2019. In total, 700 runners will be able to compete in 2019 again!